NGOs are calling for international recognition and have formed a coalition consisting of 12 organizations in hopes of gaining a stronger voice in political bodies such as the United Nations. “Now NGOs are going to several committees and representing one united voice. So when one of us signs something, they’re signing in the name of all of us. That makes us stronger,” says the delegate from the conflict-resolution organization Search for Common Ground. 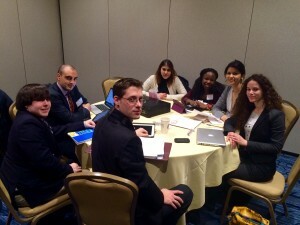 The “united we stand, divided we fall” approach has been working well so far for the NGO coalition at the sixty-first session of the Harvard National Model United Nations conference. Coalition organizations include: Oxfam International; Refugee International; Amnesty International; Society for Nutrition, Education & Health Action (SNEHA); Freedom House; Search for Common Ground; Transparency International, BRAC (formerly Bangladesh Rural Advancement Committee); Ceres; International Crisis Group; Electronic Frontier Foundation; and finally, the International IDEA: International Institute for Democracy and Electoral Assistance. It is no news that international non-governmental organizations do important and often difficult work for those who without them would be left helpless and voiceless. Unfortunately, these organizations have not been given enough agency in international political bodies. The NGO coalition wishes to change that. “We think that what we should really value is dialogue and cooperation. This coalition allows us to do that,” says the delegate from the International Institute for Democracy and Electoral Assistance. Overall, the NGO coalition is hoping to unite more efforts and organizations in order to have a joint further reach in committees and in international issues. An in-depth look at the topic will follow this afternoon from The People’s Daily.